The Federal Highway Administration responds to the request to toll parts of I-5 and I-205 in the Portland area. The federal government is likely to approve Oregon's request to toll parts of I-5 and I-205 in the Portland area, but needs more information to make a final decision. The Oregon Transportation Commission (OTC) requested permission from the Federal Highway Administration (FHWA) to impose the tolls to reduce congestion and fund improvement projects on Dec. 10, 2018. The requests were made at the direction of the 2017 Oregon Legislature, which declared congestion on Portland-area freeways to be a statewide problem. The FHA responded to the OTC and the Oregon Department of Transportation (ODOT) on Jan. 8. The letter signed by Oregon Division Phillip Ditzler said additional project detail is needed prior to final approval, but that both requests are "likely eligible" for tolling under the federal Value Pricing Pilot Program. "This is a major step that will help us keep moving forward in what will be a long process," OTC Chair Tammy Baney said of the response. "In this letter, the FHWA acknowledges the work completed in our feasibility analysis and points us toward the next steps we need to take to use tolling in Oregon to help us maintain a transportation system that will meet our growing needs." • A seven-mile stretch of I-5 between North Going Street/Alberta Street and Southwest Multnomah Boulevard in Portland. 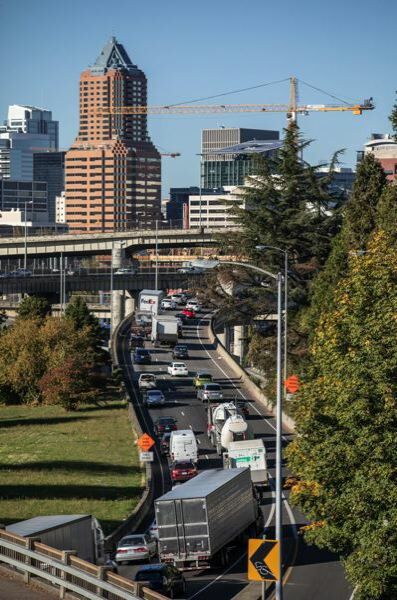 These tolls are intended to reduce congestion and to help fund the I-5 Rose Quarter Improvement Plan in one of the most accident-prone corridors in the state. • I-205 in and around the Abernethy Bridge near Oregon City, with the exact location still to be determined. These tolls are intended to ease congestion and finance the planned highway widening and seismic strengthening of I-205 between OR 99E and Stafford Road, including the bridge. According to ODOT, in order to address the requirements outlined in the FHWA letter, it expects to begin the next round of technical analysis and public engagement in late spring. The FHWA letter also said public outreach is critical to the success of the project. "The FHWA cannot overemphasize the value of a transparent public involvement outreach and marketing effort to inform the region on the realities and myths of tolling, the issues the OTC/ODOT seeks to address, and the state's vision for tolling in the region," the letter said. "An aggressive public involvement, outreach and marketing effort serves to streamline the overall project delivery." You can read the letter here. You can read a previous Portland Tribune story on the issue here.